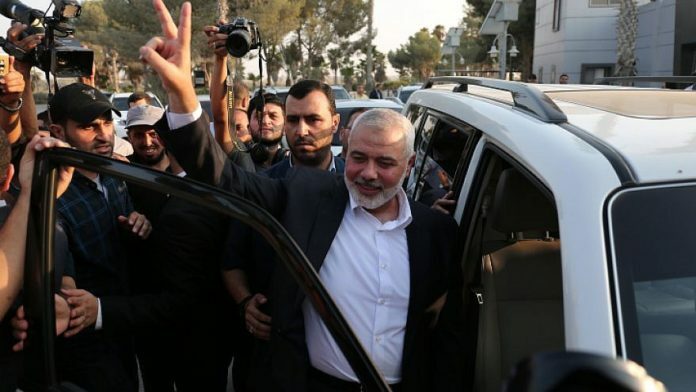 Hamas military leader Yahya ?Sinwar reportedly demands Israel pay Gaza’s rulers $15 million ?a month or face increased border violence and ?arson terrorism • Israeli policy in Gaza will be dictated solely by its security ?interests, PM Netanyahu asserts. (October 28, 2018 / Israel Hayom) Israel will not accept any ultimatums from Hamas and ?its policy in Gaza will be dictated solely by its security ?interests, Prime Minister Benjamin Netanyahu told his cabinet on Sunday. Speaking ahead of the weekly cabinet meeting, Netanyahu ?dismissed a demand by Hamas military leader Yahya ?Sinwar, who reportedly urged Israel to pay Gaza’s rulers $15 million ?in cash every month or face an escalation in border violence and ?arson terrorism. “There is no way Israel will accept any ultimatum posed by Hamas,” Netanyahu said. The terrorist group further demanded that the first ?payment be made by this Thursday, according to Channel 12 news. According to the report, Sinwar said the funds would go toward paying Hamas functionaries’ ?wages. The demand seeks to circumvent the financial ?sanctions imposed on Gaza by Palestinian Authority ?President Mahmoud Abbas, whose Ramallah-based government has frozen ?the transfer of funds used to pay Hamas’ ?wages as part of efforts to wrest control of ?Gaza from Hamas. ? The cabinet was to discuss Hamas’ threats, ?as well as the recent border flare-up in its weekly session. The Israeli Air Force bombed 80 terrorist targets in ?Gaza over the weekend, after Islamic Jihad terrorist ?fired some 40 rockets at southern Israel.? The Iranian-backed terrorist group later agreed to ?an Egyptian-brokered truce with Israel. ? Sunday’s cabinet meeting began with a moment of silence in ?honor of the victims of Saturday’s mass shooting at ?a Pittsburgh synagogue, which left 11 people dead ?and six wounded.? ?”Israel mourns with the families of the victims who ?lost their lives in the horrendous Pittsburgh ?massacre,” Netanyahu said.? ?”On behalf of the Israeli public, I extend our ?condolences to the families. We stand as one against ?anti-Semitism and such barbaric violence,” he said. ?